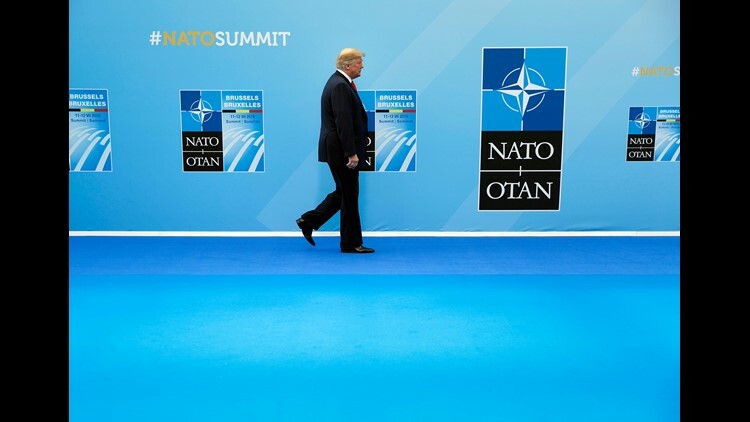 President Donald Trump walks in as he is introduced at the summit of heads of state and government at NATO headquarters in Brussels on July 11, 2018. NATO leaders gather in Brussels for a two-day summit to discuss Russia, Iraq and their mission in Afghanistan. Is nothing safe from Trump's China tariffs? Oxygen. Cat food. Yarn, sandblasters and shingles. All could get pricier under new tariffs threatened by President Trump, which would effectively tax those goods — and thousands more — as they arrive in the U.S. from China. Trump claims China already uses "harmful industrial policies" that make the tariffs payback for unfair practices. China, which says Trump's ignoring well-established trade rules, could hit back with its own levies (again). Republicans and Democrats alike thumbs-downed the tariffs list that dropped Tuesday, as did U.S. business owners who expect to be hurt by them. This is OnPolitics Today: Subscribe here. "Germany is totally controlled by Russia," Trump said at the summit's start on Wednesday. That's extraordinary rhetoric, aimed in this case at Germany's support for a Russian natural gas project that would put a pipeline through Europe. "Germany, as far as I’m concerned, is captive to Russia," said Trump, who himself plans to meet privately with Russia's Vladimir Putin next week. But after facing German Chancellor Angela Merkel on Sunday, Trump seemed to change his tone. "We have a tremendous relationship with Germany," he said. Lower-ranking members of federal agencies could face jail time, or agency heads could receive public shaming in court — both of which could delayed by appeals. Or the judge could fine the executive branch and put the money toward aiding separated families. But legal experts told us all those options, thanks to questions of legality and longstanding tradition, seem unlikely.